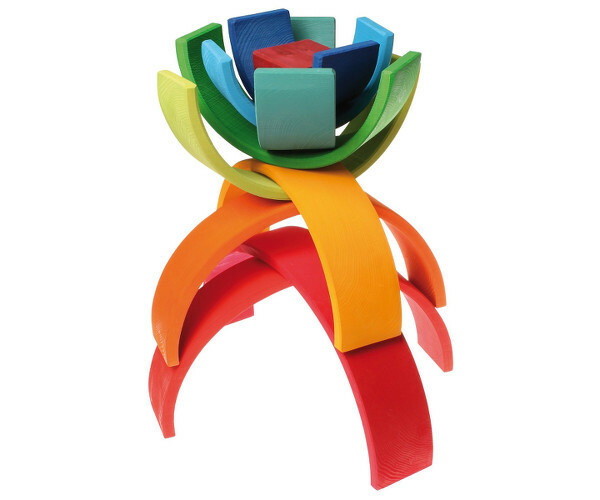 Here’s an amazing and colourful stacking toy with a difference – and the difference is size. When is a set of stacking blocks not just a set of stacking blocks? The answer is – when it’s big enough to hide in. They say good things come in small packages, but sometimes the opposite is also true: making something enormous makes it much greater. 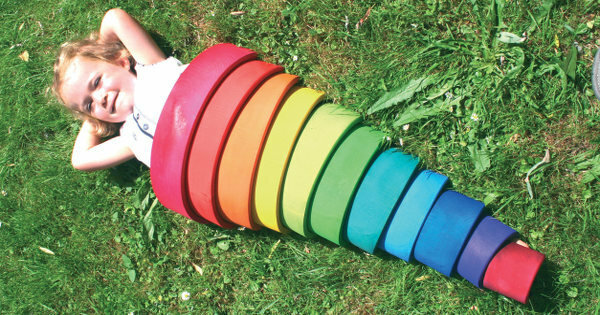 The extra large wooden stacking rainbow from Grimm’s Spiel und Holz is just such a toy. And while you might be thinking that this is the kind of toy that’s really only for babies, you’d be wrong. In fact, the recommended age for this one is ten years and up. So don’t worry, parents of tweens – you haven’t missed the boat. Like all the products from Grimm’s (check out their amazing Colour Chart blocks here) – this one is a feast for the imagination. Kids will discover plenty of new ways to have fun with this rainbow, all the while working out their imaginative powers and getting an education in the colour spectrum. These nesting blocks can be balanced or stacked in plenty of different ways, and they’re big enough to hide inside too. You can find the Grimm’s extra large stacking rainbow locally at Honeybee, for $125.